According to Digimon Masters Online official news, for 2018 World Cup, there are some updates and events in Digimon Masters Online official website. Let's see! The secondary password of Digimon Masters Online has been updated for advanced security. 1) Secondary password set by 4~8 digits of number has been changed to 6~8 digits of numbers + symbols. 2) You can change your second password immediately by clicking the [Change] button on Second Password interface. 3) These changes applies only on Gameking. 1) Information about Digimon size has been added to display during Tamer Exchange. 2) Now you can switch Digimons' location in Digimon Storage. 3) You can click the locked slot in Digimon Storage to unlock it when you have [Digimon Archive Expansion +1] in your inventory. 1. How about Some Chicken for the World Cup Season? 2) 5 Chicken Combo (recovers HP 8000 / DS 6000) will be given as 30 minutes log-in reward during the event. 2. Special Discount for Global-wide Festival, World Cup! Period: After maintenance of 19th Jun 2018 ~ before maintenance of 3rd Jul 2018. Items in Cash Shop will be on sales at a 30% discount rate during the event. 1) Discount Rate in Steam is set to 30% (not an additional +30% discount). 2) Some of the items including promoted items may be excluded from the discount event. 3. 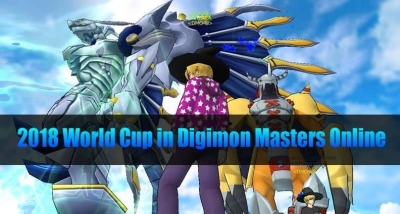 2018 World Cup in Digimon Masters Online! Period: After maintenance of 19th Jun 2018 ~ before maintenance of 17th Jul 2018. Find Soccer Balls from Digital World: You can obtain Soccer Ball of Experience or Golden Soccer Ball from Evil Digimons (exclude Yokohama Village) by certain chance. Puppetmon offers you to play card game with him. Play card and get rewarded during the event! Period: After maintenance of 19th Jun 2018 ~ before maintenance of 24th Jul 2018. 5. Log-in event! Play the game and claim rewards everyday! 1) Rewards will be given every 30 minutes, 4 times a day when you're online. 2) Rewards can be claimed from Gift & Reward Item Storage. Please claim the rewards before 7 days, or they'll be expired. For more information, Check out the Digimon Masters Online site. We will continue to update Digimon Masters Online news.